The 6-foot-3 righty became an All-American pitcher at the University of Wisconsin. 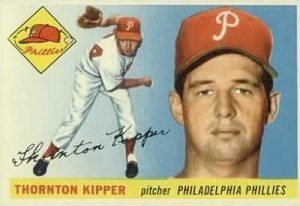 I asked Kipper about being a Wisconsin native in the majors, debuting in 1953. Did anyone he know see him pitch in person? As a Phillies veteran, could he recall the look and feel of Philadelphia’s Shibe Park and its neighborhood? Most of all, did one of his three career victories from 1953 seem ESPN worthy — a moment he was proudest of? “1. Many times — results were usually good, although I did walk the winning run home in the ninth inning once with 50 relatives and friends in the stands. 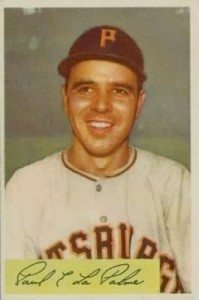 Also, pitched my first game in the majors (in Milwaukee) – a loss to Warren Spahn. 2. (Regarding Shibe Park) Terrible neighborhood, very dark, dreary atmosphere, and no parking facilities to speak of except one lot and on-street. Baseball is a game of irony. This career Philadelphia pitcher treasured memories not of Shibe Park, but his real “home” ballpark, County Stadium. 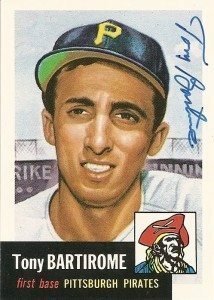 Tony Bartirome isn’t the Pirate you might think he is. I wanted to know about all he experienced as a player and trainer. His short reply contained three surprises. I wrote to Tony to see beyond the brief bio. Bartirome’s signing by Pittsburgh’s legendary Hall of Famer Pie Traynor and hopeful debut on the opening-day Pittsburgh roster at age 19 for the 1952 Bucs faded fast in a nightmarish year of 112 losses. The first baseman’s career wasn’t short-circuited by the poor season. Drafted into the Army, his career faced a two-year derailment. After hanging up his glove, Bartirome returned to Pittsburgh again in 1967, beginning a career as head trainer that concluded in 1985. Keeping the ailing Roberto Clemente in the lineup must be one of Bartirome’s enduring accomplishments. I wanted the Bartirome take on the place he played and worked. Tony’s answers on Forbes Field and more? “1. I remember the people that worked there. The ushers, ticket takers. They were like our family. 2. Roberto was one of the funniest men and most generous man I ever knew. 3. Two years in the service, never picked up a ball. Got hurt in spring training. Set me back. Beyond statistics, Tony Bartirome remembers the people. I hope Pirates fans remember him. His reply, squeezed onto a 3-by-5, was dated 3-15-76. “Hi, Tom — Al Lopez was a great manager. He was great to play for. with my family, golfing in summer and cycling in winter. Michael, Terry (his children) and myself we cross-country ski and we love it. Why did I keep such a chatty family update from a person I’d never met? He may not have been a star to many. But Paul LaPalme’s family were stars to him. I wrote my first baseball “fan letters” in 1972. Bob Veale was the first major leaguer who ever signed my self-addressed six-cent government postcard. I believed that every player sat by his locker waiting for mail from me. Starting in 1974, I found that fellow Iowan Jack Smalling published his collection of home addresses of former players. Hal Naragon, who caught for Bill Veeck with the 1950s Indians, replied when his former boss reacquired the White Sox. I felt like a smarter fan. I wrote to Phillies general manager Paul Owens. Four years early, I knew Philadelphia’s baseball future. I never attended that 1980 Series. I never met “The Pope.” I had something almost as good. I was a fan who mattered. Sadly, I joined the ranks of most collectors in recent years. I despaired over “Refused. Return to Sender” rejections. I winced over cup-of-coffee players who demanded cash for their signatures. I stopped trying. Enough moping on the bench. I’m back on the field. I’m taking my hobby back. I chased signed baseball cards for years. It’s a new season. Now I’m collecting recollections. In the days ahead, I’ll be sharing the baseball memories that are filling my mailbox again.